Facebook – Fabulous or Failing? Is Facebook really threatened as the younger demographic shift to using other messaging platforms? An article in Variety Aug 23 (see here) discusses research by emarketer that forecasts teens and tweens will desert Facebook in favour of SnapChat next year. The author notes this is not a new trend and questions whether this is of concern to Facebook. I’d say Facebook is well on top of it. Having created and released ‘Poke’, an app similar to SnapChat that failed its objectives when Snapchat arrived, Mark Zuckerberg and the management at Facebook recognised SnapChat’s appeal and potential back in 2012. They first approached their competitor to gauge their interest in being acquired and made what was ostensibly a takeover offer of $3 billion in 2013, which was famously rejected. Both platforms continue to develop in a manner that serves their shareholders demand for financial performance and their users demand for features and facilities, but each has a distictly different mindset in management and strategy in serving them. One is determined to focus on a niche market of younger users, without the support of a broader purpose in terms of a business operation. The other takes a far broader strategy, emulating the features enjoyed by the same audience in its messaging app, while providing a far broader, collaborative social media business with it’s other affiliated platform operations. To treat the motivation for all content being shared as standard and to treat all tweens and teens as homogenous clones, is to miss the deeper rationale of what feeds both services. Both apps offer simmilar and different features and the purpose or function of the post will dictate the users preference. Strategic and psychological considerations also play a big part in deciding who uses which app with some seeking and coping with adoration or condemnation, and others shunning this by choosing the app that doesn’t measure public opinion. Whether the post is of a personal or commercial origin can also weigh in on the choice of platform for an audience. Now one in five Instagram Stories posted by a business receives a Direct Message reply, allowing Instagram to seduce advertisers who want private channels for communicating with customers. This is where being associated with a larger social platform that has extremely strong engagement cross polinates and boosts revenues to benefit a visual messaging ap. While younger demos may be currently shifting to SnapChat, they are loyal only until the next new thing, so while the ascent of a tech company can be comparatively qucik, the downfall can be ruthlessly rapid. It’s also not likely that Facebook itself is not staffed with, engaged with or intently listening to this swinging demographic. I’m comfortabale with that assumption. 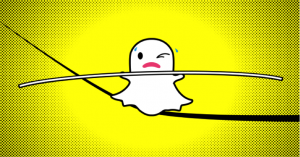 SnapChat has significant competition as a stand alone visual messaging app from other messaging apps like Instagram, WhatsApp, Messenger and WeeChat and Instagram is diverting growth, mind share and advertisers away from Snap Chat. This is evident in the performance and share price, which had a mild up tick recently when rumours swirled of Google making a $30 billion offer. Convenient or coincidence aside that Google Chairman Eric Schmidt was an advisor to Evan Spiegal and SnapChat is committed to spending over $2 billion on Google cloud hosting, I think that at some point in the very near future, SnapChat should allow itself to be absorbed by a larger partner like Google or Amazon who can bring the benefits of AR, VR, vast data capabilities and resources. If Zuckerberg is worried, he’s not showing it having recently taken two months paternity leave for the birth of his second child. Co founder and CEO Evan Spiegal and fellow founder Bob Murphy stood to make $750 million each at the time of Facebook’s offer, but Spiegal “didn’t find that interesting” compared to the opportunity of building the business. Now as the forces of competition are being felt on all fronts, including a market cap that at $15 billion is half that of what it was at listing, it will be intersting to see if the founders judgement can be as humble as it has beeen innovative.